Establishment of the New Development Bank will be finalized at the BRICS summit in Ufa next month. Economists, bankers and business leaders believe the new institution will help rapidly growing BRICS and developing economies get required investments for infrastructure and development; something the existing Bretton Woods institutions have not provided fully. 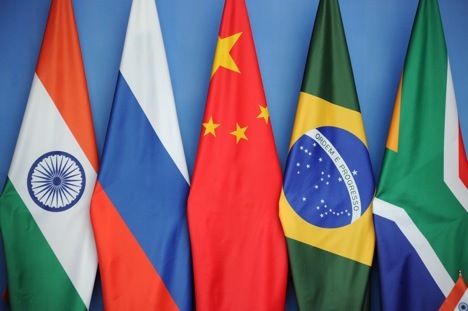 After several years of intense negotiations, BRICS leaders finally established a $100 billion Contingency Reserve Arrangement (CRA) and the New Development Bank (NDB) at the Sixth BRICS Summit in Fortaleza, Brazil, in July last year. The countries agreed to share the $50 billion initial subscribed capital of the bank, and hence the voting rights, equally. Analysts believe the launch of the BRICS bank will give member countries the opportunity to fulfill their economic ambitions and will boost infrastructure investments in the emerging economies whose infrastructure development needs cannot be currently met by existing multilateral financial institutions such as the World Bank, Asian Development Bank (ADB) and others. According to Amar Bhattacharya, distinguished economist and Senior Fellow at the Global Economy and Development Program at Brookings Institution, infrastructure remains the major growth constraint in most emerging and poor countries. “1.4 billion people have no access to electricity, 0.9 billion have no access to safe drinking water and 2.6 billion no access to basic sanitation. Annual financing needs in those countries combined are estimated at between $ 1.8 and 2.3 trillion”, he wrote in a paper in 2013. The situation has not significantly changed since then. Given the ongoing changes in the geopolitical system and global economics, the importance of having its own financial instruments has become vital for BRICS countries, especially for Russia which will assume the presidency of BRICS at the Ufa summit. Vladimir Dmitriev, Chairman of the Bank for Development and Foreign Economic Affairs (Vnesheconombank), announced several priorities for the NDB which are in line with national development banks. Removing infrastructural constraints for growth is one of them. “The role of national development banks is to assist the New Development Bank in a fast manner to be functional. In Ufa next month we will sign special memorandum for the New Development Bank,” he said at SPIEF 2015. “The challenges that we see in terms of work that has to be done in developing countries are great. BRICS countries need new developing partners and this bank is such a partner”, said Kundapur Vaman Kamath, the recently appointed first President of the NDB. K.V. Kamath, the former head of India's largest private bank ICICI and former chairman of Infosys Limited, the second-largest Indian IT company has been nominated as the first President of the BRICS NDB for a 5-year term a month ago. Between 1988 and 1996, Kamath served at the ADB in Manila, supervising projects in South East Asian countries. According to the bank's governing structure, this position will next be transferred to Brazil and then to Russia. It will be headquartered at Shanghai, China. Yang Shaolin, Director General of the Department of International Economic and Financial Cooperation, Chinese Ministry of Finance, pointed out the uniqueness of bank's governance structure: “While the existing institutions are predominately controlled by developed counties, this is a new experiment where five developing countries share their voice equally. We also will try our best to improve the operating structure and make it more efficient and effective”, he said. “This bank is ready to learn from exiting institutions as well as complement them, replicate the good practices they have so far. And certainly we will try to be more effective in mobilizing financial resources. Lastly, we will try to provide services to our clients which are the ones that really needed”. The NDB will focus on funding infrastructure and sustainable development projects in BRICS countries and other parts of the developing world through loans, guarantees, credits and equity investments. The focus on infrastructure is not only logical, according to experts, but unavoidable because, despite existence of multilateral development agencies, the need for investments is higher than they can provide. “We have a huge challenge in the world. We have about a billion people that are in poverty now. The World Bank has committed to eradicate poverty by 2030, but we cannot do it alone. So we actually welcome this new institution,” said Pedro Alba, Vice President for Budget, Performance Review & Strategic Planning, The World Bank Group. Economists believe institutions like the NDB set up by BRICS countries could be such brokers, since they would finance bankable projects or they make projects bankable by working with governments and addressing policies. Such banks mitigate the risks on the side of private sector and augment the pool of affordable financing as they are able to borrow on terms that other cannot, Bhattacharya argued. “This new institution also brings a very important and powerful dimension in the changing world: it helps the global south recycle its own saving instead of putting it in the US budget deficit, and these savings can be used for financing infrastructure projects in the developing world,” Bhattacharya said. Yaroslav Lissovolik, chief economist, Deutsche Bank in Russia, agrees. The new bank would deal with paradoxes that the world economy has been grappling with for the last decade. “There are so many savings in the emerging markets and none of the existing institutions there can allow these savings to productively work to boost growth rates and development. This is the niche and ultimate demand for this new institution,” he said. Analysts note that despite clear interest from BRICS leaders and business community, it is not yet clear whether mandate of the new bank will be extended to incubate a non-dollar financial architecture. The negotiations between members on using local currencies instead of the US dollars are continuing. Article 24 of the Agreement on the NDB provides the possibility of financing in the local currency of the country in which the operation takes place, provided adequate policies are put in place to avoid a significant currency mismatch. However, for enabling trade in local currencies the bank will have to enable currency swaps between the central banks of the country members. Many fear that the NDB may not stand the competition of the $100 billion Asian Infrastructure Investment Bank (AIIB), recently established and led by China (a larger contributor to the bank’s capital base), which now has 57 members, including other BRICS members, almost at the same time. Kamath believes the NDB’s mandate is broad, allowing it to source funds both in the public and private sector. He said the bank's recently appointed senior functionaries, including himself, are moving to Shanghai next month to take up their jobs. “After 9 months from now we will give shape to the bank,” he said.